One large, yellow brick building by the sea. I was a bit optimistic thinking I could do this in one post, so I added some more photos and made it two! Locational photo of the military area. The barracks, over the back, were demolished a long time ago. To the left was Rose Cottage, the senior officer's house. The orange/yellow cottage was the married officers quarters. To the right of this, in a smaller cottage now demolished, was the school for free children. 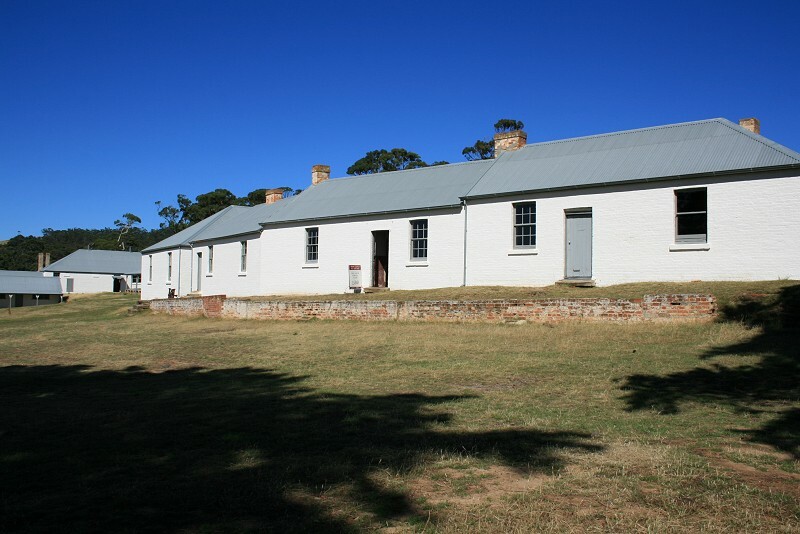 Two of the Carnarvon-era buildings. Commandants House. I love that this place isn't presented like the usual old house museum with rooms full of nothing but period furniture usually sourced from elsewhere, which makes it interesting to look through. If you pick the house up and put it elsewhere, it would be worth a visit just on its own. My favourite ruin is the hospital, built 1842, with 4 wards to accommodate prisoners and soldiers. There was one ward top and bottom behind the existing gable, so I assume two on the other side as well. Bought by the Catholic Church for use as a boys home. Burnt down in 1895 bushfire, but they rebuilt. Burnt down again in the second bushfire. Coming back from the dockyard, there's a couple of weatherboard cottages, from the early 20th century which didn't rate photos (one was in use, one hiding behind bushes) and now I can't remember what they even were. Then on from them, also behind some bushes, there's a brick shell. There's a lot of brick shells around this place. The bricks are different though. At least, I assume that's what mother noticed. "Is that some modern building?" I did go to find a link to use, but that turned out to be a very bad idea. So, no words, except those that are already there. The road leading to the dockyard. The eucalypts along the edge of the road were apparently planted in 1860, just in case you ever wondered what 150 year old gum trees looked like. Here's one thematic grouping: paupers' mess (at front), asylum (orange building with sandstone tower at the front and separate/model prison (low brown/grey building at rear). You can see the connection? In the late 1850s there was an influx of invalids and paupers that had formerly been housed in the station at Impression Bay. To cope with them, four timber dormitories and a mess hall were built. The timber dormitories were demolished. The mess here was destroyed in one of the bushfires. From the mess, that's the hospital on the hill. View from on top of the hill. (Yes, that big brick thing is the penitentiary, it's a bit hard to avoid it :) The ruins, except for the dockyard, are on this side of the site. The big open space is a cricket oval. The shiny visitors centre is up to the left, in the trees. The smaller brick building just in front of the trees used to be a cafe. Part of Civil Row, a row of houses built for the civil officers (surgeon, accountant, medical officers, magistrate & chaplains). See the long, glass-fronted building at the back? That's the motel we stayed in. That's called "close to the historic site". Rather convenient (also, breakfast is included in the room price). Other half of Civil Row and the Church of the Glowing Windows. The little weatherboard building is St Davids Anglican Church, built 1927. There were more houses at the military end of town. These steps led up to the garden of Rose Cottage, home to the senior military officer and his family. Steps from the cottage. According to the information panel, it was a timber cottage but the kitchen and outbuildings were of brick, which is what remains now. It survived the 1895 bushfire but fell to the 1897 fire. A good view of the dockyard from here. Next door to Rose Cottage and at the end of the road, is the commandant's house. From the driveway, through the ornate entrance gate, you get a good view of the rest of the site.